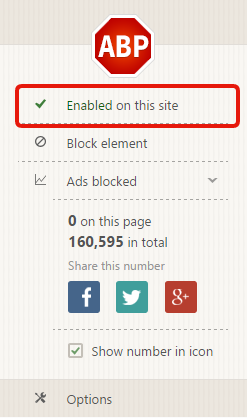 Here are three easy steps to disabling AdBlock or AdBlock Plus on gyazo.com. We appreciate your support! 1. Open any Gyazo image page with your web browser. 2. Click on the AdBlock icon in the upper-right corner of your browser. Select "Don't run on pages on this domain". 3. 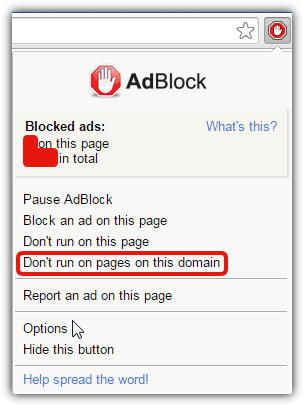 After a pop-up box appears titled “Don’t run AdBlock on…”, click on the button that says “Exclude”. 2. Click on the Adblock Plus logo in the upper-right corner of your browser. 3. Click "Enabled on this site". 3. 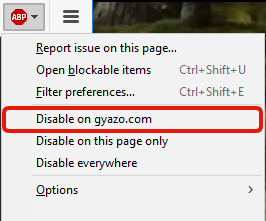 Click "Disable on gyazo.com".